Scholars believe the famous poem by Percy Bysshe Shelley (1792-1822) - which he called "Ozymandias" - was inspired by a statue of the young Ramesses II located in the British Museum. 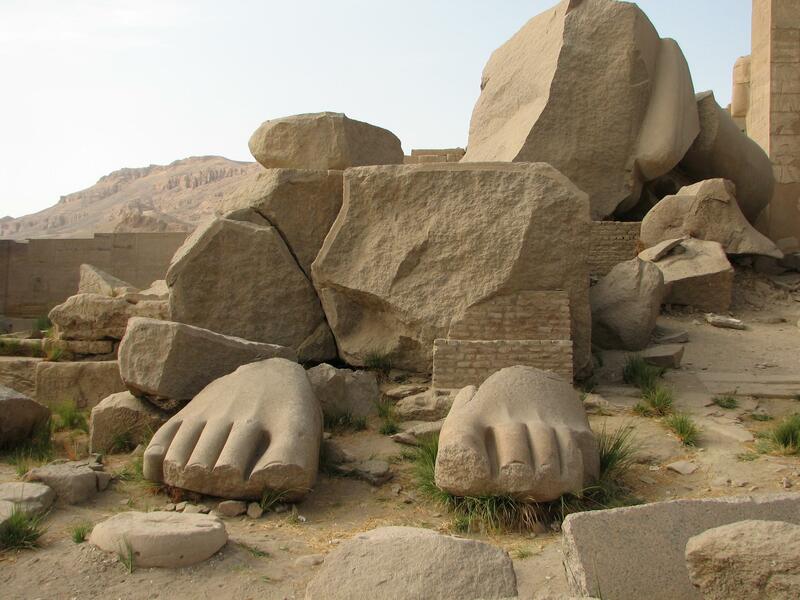 “Ozymandias” is the Greek name for Ramses II, who ruled Egypt for sixty-seven years from 1279 to 1213 BC. He was a military conqueror and a great builder, but Shelley’s sonnet describes how the achievements of even the mightiest tyrants are obliterated by time. Ramesses II was greatly impressed with himself and his accomplishments. He had the Ramesseum built to honor him. Today, it - and his statue - are left in ruins, as depicted in this photo, by Hajor (License CC BY-SA 3.0). In this clip, the poem is read by Carole Bos (creator of Awesome Stories). You can read the text as you listen. When you do, think about these topics. ISSUES AND QUESTIONS TO PONDER: What is Percy Shelley telling us in this short, but powerful, poem? Is he ridiculing the long-dead king who boasted of his power and might - or - is he expressing pity for him? What are the things which matter most in life? Is it the ability to "lord it over" others? To build monuments which underscore greatness (of a person or a country)? To show kindness and compassion to those who need it? Do Shelley's words still ring true, when we consider leaders of nations - or regimes - which rise and fall or come and go? Why, or why not? Shelley's manuscript of "Ozymandias" - and a copy which he penned in 1817 - both survive. They are maintained by the Bodleian Library, at Oxford University. "Ozymandias," by Percy Shelley; read by Carole Bos. Bos, Carole "Ozymandias, by Percy Shelley - Audio" AwesomeStories.com. Oct 07, 2013. Apr 18, 2019.